The comic book industry has relied on licensing from other media since its inception. Early comic books were repackaged versions of comic strips. The comic book came into its own as a medium separate from the newspaper strips that spawned the format by the late 30s. Throughout the medium’s history, comic books were published that featured popular concepts from an comprehensive array of media. This included film, radio, television, novels, short stories, toys, corporate mascots, comedians, animation, comic strips, video games, pop music, opera, theater, and poetry. In most cases the stories of characters from other media in the comic books were not adaptations. The tales featured new adventures and stories of pre-existing characters. The most successful example of this would be Donald Duck, where the seeds of the Disney short features flourished under the guidance of cartoonists such as Carl Barks and Don Rosa. Creators such as these expanded the core concept well beyond what was achieved in a 7 minute animated short. More typically in media transliteration, the new material retained little inspiration from the source. 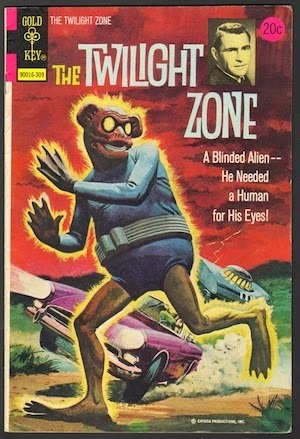 An example of this it the Gold Key Twilight Zone comic, which used the licensed concept as an umbrella under which to package strange and spooky short stories which featured only the thinnest of connection to Rod Serling's anthology program. Next stop, up ahead.. a teddy bear with flippers.. Most comic book tie-ins were safe, bland, by-the-numbers adventures that in no way indulged in significant universe building. The comic book series Mr. District Attorney was not conceived as a series of tales to be interpolated between episodes of the long running radio and TV series. This is not to say that these types of books failed to have creative merit, but from the 30s through the 60s a licensed book was often as much a marketing tool as it was an independently successful creative endeavor. There were certainly many journeymen cartoonists, writers, and artists that made their unique mark on all sorts of comics, including those already mentioned. In other cases, licensed comic books could act as a jumping off point for up and coming creators. The publishers that made most use of these licensed of comics found themselves creating a safe and steady work environment for artists that were better suited for genres outside the ever increasing market share that super heroes held. By the end of the 1960s Marvel was beginning to pull ahead of DC in market share. Marvel was focused almost exclusively on their energetic and dynamic super hero line of books guided by concepts created earlier in the decade by Stan Lee, Jack Kirby, and Steve Ditko. Not everything Marvel published did was a roaring success, but books such as Spider-Man and Fantastic Four were gaining new, more mature audiences and resonating with readers well over the age of 12. Due to distribution agreements, Marvel's output was very focused, and was limited in the number of titles a month they could release. DC during the end of the 1960s had a strong core, and had been experimenting with new ideas. Despite a lot of efforts in a number of genres, none surpassed established successes like Batman and Superman. Their forays in licensing were limited to very few examples. Most notably, Bob Hope and Jerry Lewis both had series through DC/National that ran through the entire decade of the 60s. The secondary publishers of the late 60s and early 1970s included Harvey, Charlton, Gold Key/Western, Archie, Warren, and several lesser-known entities. Harvey and Archie were committed to children’s comics which featured well known characters that originated with the publishing imprints. Harvey was home to Caspar, Hot Stuff, Wendy, and Richie Rich. Archie was home to the eponymous all American teen, Betty, Veronica, Sabrina, and Josie and the Pussycats. In the case of these two publishers, the work was often adapted into animation and other media, but the reverse was incredibly rare. One of the few exception was the Archie imprint Spire, which featured Christian themed stories, often delving into biographic tales about such well know born-agains as Watergate figure Chuck Coulson and musician Johnny Cash. Warren was going after a much older crowd with a line of rough and tumble black and white horror magazines, which included Vampirella, Eerie, and Creepy. There was a very close relationship between Warren and films thanks to their flagship title, Famous Monsters of Filmland. Although they had a mail order arm that sold a wide variety of genre film merchandise, they never published an adaptation of an existing film. Charlton was a trend follower, and through quantity often compensated for what they lacked in quality. Charlton's motto was to keep the presses running, and they did so by publishing comics from every known genre including western, war, horror, romance, sci-fi, hot rod comics, TV tie-ins, and action heroes. 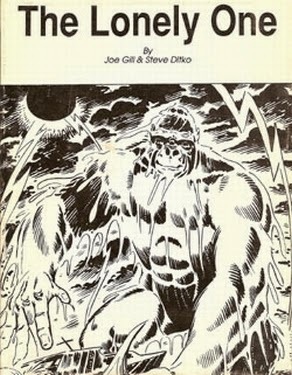 They produced few film adaptations, most notable of which are Gorgo and Konga adapted by Steve Ditko in the 1960s. Gold Key/Whitman had something different from these other companies. They inherited the Disney license. This meant they were the one publisher with the ability to easily carry on the decades-long tradition of movie adaptations. Disney ensured their films received adaptations in comics since the mid-1950s through a long-standing agreement with Dell publishing. Most of these adaptations, featuring classics such as Shaggy Dog and National Velvet, were published under the umbrella title Dell Four Color. Some were done as one-shot issues, unattached to a series as is the case with Mary Poppins. As the license moved to Gold Key a slightly different approach was taken. Beginning in 1970, there would be a single series, Walt Disney Showcase, wherein all of the film adaptations would live. The series was not exclusively movie tie-ins, but all of the Disney film comics from 1970 through 1979 were published as a part of this series. Who are.. what are.. THE BOATNIKS!!! What other publishers attempted movie adaptations? Although no other publisher had a long term licensing deal with a film distributor, many gave it a shot. 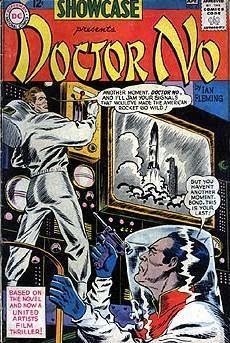 In an early non-Disney effort, DC offered up issue 43 of their Showcase Presents anthology to Doctor No in the early 60s. It was a reprint of the UK adaptation of the novel, and marketed here as a film tie-in. The word Bond appears in a word balloon and not even in bold. Barely a blip on the radar, and one of the very few pre-1970 efforts for this type of tie-in. Can you feel the beat Mr James? By 1970 there was a serious contender for number one comic company that was looking to expand very, very rapidly once their distribution network allowed for it. The publisher needed material- and fast. They began looking to licensing deals, pubic domain material, reprints form the company's early years, as well as drawing on the creative energy that a bunch of adult comics fans breaking into the industry could bring to the company. Marvel was expanding quickly, and getting into the movies seemed like a good idea.